After the release of blockbuster hit Baldur's Gate, Interplay's audio department wasted no time to start planning sound design for Planescape: Torment. Craig Duman, Supervising Mastering engineer, began by pouring over the Advanced Dungeons & Dragons collection of rulebooks that define the massive Planescape universe. This in-depth research was then used to create an effects list that eventually reached over 1500 sounds. A team consisting of 12 audio designers and engineers created the sounds for Torment. Talent like David Farmer of Skywalker Sound contributed more than 300 spectacular spell effects. Farmer's credits include work on Armageddon, Mortal Kombat, Con Air and The Mask as well as games such as Baldur's Gate, Fallout 2 and Descent 3. Farmer molded Torment's spell effects out of many layers of sound, and on some of Torment's dramatic spells Farmer layered in effects over effects. He explains that, "During Torment, I was processing some sword hits, and they were coming up very interesting. While they didn't work for the spell I was working on, I gave them a description like 'reverberant metal tones, good spell source.' Later, I was looking for something with those qualities, but had forgotten I made those sounds. When I searched my database for 'metal tones', I found them, and they were exactly what I needed!" Other unusual sources for sound came from Skywalker's Al Nelson. Al found an opportunity to record his teething ten-month-old son. This howling effect found its way into Torment's Mortuary. Ann Scibelli of EFX, sound designer on The Mod Squad and Everest, brought Torment's creatures to life, giving each a broad set of sounds to express the creature's unique reactions. Ann used moose calls and employed techniques such as using a glass vase to create intense vocalizations. These were combined with recordings of real animals to achieve an emotional palette for Torment's myriad life forms. 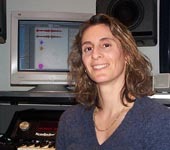 Additionally, Ann created most of the sounds in Torment's striking cinematic scenes. Audio sessions for some of these movies exceeded 120 tracks of sound, a giant amalgam of layered ambiences and sound effects. Ann laughs as she recalls that, "the hardest part was just getting the computer to open the sessions!" These sessions were later mixed together with music and dialog at Interplay's Mix stage in Dolby Surround Sound. The making of Torment effects began with ambient sound. This was to set the tone, convey the mood of each area in the game, and ultimately immerse the player in a deep atmosphere. Every corner in Torment is filled with ambient noises and looping backgrounds. These sounds even change with the time of day. "If a stove is off at night, you can hear rats running around in the pipes, or scary demon birds flying around outside," describes Duman. 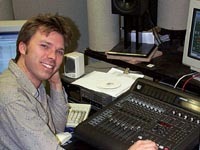 Interplay Audio Director, Charles Deenen, created the approximately 450 ambient effects in the game. Several weeks before Torment was to final, Charles propositioned Interplay sound designers to listen to a looping ambient sound from Torment and try to figure out what the original sources were for the final effect; extrapolating a recipe from a cooked meal. The effect resembled distant crickets chirping through an eerie wind. The cricket sound was strange, otherworldly, but the source could have been a summer night in the desert. That analysis was too obvious; Charles is a master of creative sound manipulation. Loading the file back into ProTools, the digital audio system in which the sound was created, allowed the team to do a little investigative research into the origins of this mysterious wind. To unlock the secret, the sound was pitched up an octave. The ambient sound became smoother, the wind and the cricket elements melted into each other but still there was nothing recognizable. Another octave and behold, the familiar hollow wailing of a….camel. It was still mutated, but the camel call was clearly identifiable. Next day there was another ambient to examine for its creative origins. This one was surely a wind, odd, but surely just a wind. This time the sound designers were mistaken. The source for this spooky, aggressive wind was a bear roar, stretched out, looped, and transformed. Deenen created the strange world of Torment out of completely alien elements with the intent to manifest a sense of disorientation, a sense of altered reality. Chattering over the camel inspired crickets and bearish winds are the many voices of Torment. The denizens of the marketplace talk to each other, and to you. They have heated familial arguments, sell their wares, and generally get on with their strange existence. From bars to small rooms, Torment is populated with intriguing background characters. Interplay's Voice Talent Director Chris Borders, wrangled in one of Hollywood's best-known walla groups to fill every area of the game with life. The Barbara Harris walla group has performed crowd sounds for around half of all recent Hollywood features. A walla group supplies background chatter, it is called "walla" because actors originally used "walla walla walla" to create the illusion of nondescript chatter. As you make your way through Torment, your companions, a bawdy, sarcastic floating skull, Morte, and an alluring thief with a Scottish brogue, Annah, accompany you through the challenges of the game. Cast in the role of Annah isSheena Easton, also known for her hit single, "Sugar Walls" written for her by the artist formerly known as Prince. Sheena is also well known for her performance of "For Your Eyes Only," the theme song for the James Bond film of the same name. Annah is a crass girl who hides her love for you, the Nameless One, behind a veil of nasty attitude. Morte and Annah taunt you throughout your travels around the city of Sigil and beyond across the Outlands and Outer Planes. Black Isle's designer and writer Chris Avellone created a masterful script for this complex environment that brings the characters to life. "Chris Avellone has a real world sense of writing," says Borders, "you get to know the characters and understand their personalities. The dialog doesn't sound contrived because the script is written like a professional screen play." Planescape: Torment shipped with the job of creating a full score for this massive universe. The design included musical themes for each of the main characters. Morgan's moody, and exotic style fit the project perfectly. Although three weeks was a very tight schedule, Craig Duman explains that, "because the music rolled in at the last minute, I was able to balance the score against the finished game." Craig made small volume and EQ adjustments to each musical segment, molding the score to fit with the ambient sounds that it would eventually play with. The music in Torment follows your actions and the mood of the game interactively. As you prepare to trounce your opponent, the droney ethereal background music suddenly jumps into the foreground, morphing seamlessly into the driving rhythm of battle music. Periodically, Mark's score seems to disappear, melting into the rich ambient sound of the game. Then quietly, the music steals back into gameplay, always shadowing the action of the game. Following in the footsteps of the successful sound design in Baldur's Gate, Interplay's audio department raised the standards of interactive audio design even further in Planescape: Torment. Rave reviews are coming in for music, sound effects, and dialog. Torment audio," as Craig Duman succinctly put it, "is Baldur's audio on steroids."